Communications strategist Amanda Walter, who spoke at the AIACC’s Now Next Future Conference in October, discusses the power of using social media to build your professional reputation. Imagine that one of your past clients, someone you’d like to work with again, is talking on her phone. The person on the other end just mentioned your firm’s name. What three words would you hope pop into this person’s mind? These words are important because they represent your desired reputation. Whether you are perceived that way today is not as important as your plan and actions toward shaping your standing for the future. Each communication you put out in the world helps influence the way your firm is perceived. Your ability to affect this change is even more possible thanks to social media. Think of your desired reputation as your destination. You can get there through any number of paths, but the right path should be directed by your audience and message. Who are they? Where do they spend their time online and offline? These questions will help you assess the channels to invest your time. What do they need? What valuable information can you offer that also reinforces the qualities of the reputation you want? The right route to your destination is like a multi-lane freeway — social media is only one of those lanes. Communications are far more effective when your messages are supported by a variety of channels. Take Gensler’s workplace practice for example. 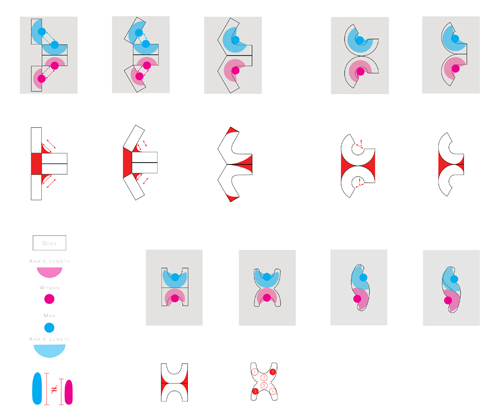 From their portfolio to the GenslerOnWork blog to their primary research—the firm’s original content creates a strong showing of experience, ideas, and knowledge exploration to anyone who might visit Gensler.com. They use social media to invite a broader public audience to read their content and exchange ideas with their designers. Collectively, these channels support the pursuit of press coverage and speaking opportunities. Earlier this year, Gensler led a panel discussion on workplace distractions at South by Southwest (SXSW) Interactive and turned to social media to build buzz and drive attendance before the event by tapping into the conference registrants with the conference hashtag #SXSWinteractive, creating a — panel-specific hashtag #how2focus as well as using hashtags commonly applied in discussions about workplace design, like #workplace, to reach a broader audience interested in this topic. The room for the panel discussion was packed and there was a waiting list of people who hoped to attend. During the event, Gensler and attendees shared quotes and insights from the discussion through Twitter. Following the event, Gensler published a digest of these Tweets and its slides as a summary of the conversation for those who were interested in the topic. Social media made it possible to stretch the reach of the panel content beyond the room. The social media channels that many firms rely on most are changing drastically. While Facebook’s changes are the most advanced, LinkedIn, Twitter, and Pinterest are moving this direction as well. These channels were initially created to help individuals stay connected with their personal networks—not for business to market them. Now that these networks have proven their channels are effective at reaching a businesses’ target audience, they are charging for it. Facebook says that your Page posts are only reaching 16% of the people who have liked your page. If you’d like more people to see your content, you have to pay to boost your post. 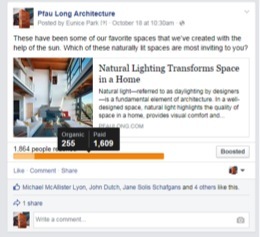 Architects typically shun advertising, but I encourage you to consider promoting your content in this way. For a $10 boost, Facebook allows you to specifically target the demographic you want. These could just be your fans or you can get more specific, and, for example, target San Francisco and Marin County residents who also “like” Dwell Magazine or Architectural Digest. With the capability to reach out to a very specific audience, it’s important to weigh the value of your content. Does it reinforce the reputation you want? Is your content useful to this audience? Do you want to invest your money on a post that takes your readers to another website? If you don’t already have a blog, you may want to start one. Another way to extend the reach of your messages with social media is to focus on the relationships you have with people who can share your content to their related, but different audience. Alta Planning recognizes the value in their employees’ networks and taps into their personal commitment to the shared mission: improving communities for bicyclists and pedestrians. The firm’s blog consistently provides valuable content for the communities it serves, helping them build and maintain momentum for their safe streets. Employees are the blog’s primary contributors. While the authors clearly have incentive to share their own content, Alta encourages everyone in the firm to be active on social media and gives them specific ways to join the advocacy. A weekly internal newsletter offers specific messages relating to Alta’s blog content and themes for their various offices and communities that can be shared. In the end, it’s really about relationships. Social media platforms are proven tools for strengthening existing relationships and creating new ones. For businesses, these relationships are based on the value that you can provide. What you share through these channels help people to assess that value. Going back to Gensler’s SXSW workplace distractions panel, the Twitter chatter from the event caught the attention of the head of workforce strategy from a major brand and compelled this person to reach out to Gensler. What started with a tweet eventually led to an invitation to propose on a significant design project. Follow these four steps and you will get there. Amanda Walter is a communications strategist who has focused exclusively on the built environment for more than a decade. Her book Social Media in Action: Comprehensive Guide for Architecture, Engineering, Planning and Environmental Consulting Firms, has been recognized as an essential resource for marketing and communications in the A/E industry. Find her at www.waltercomms.com or on Twitter at @waltercomms. Thanks for sharing this Mark! Process: Standing room for two.